The image beside shows a group of "portatrici carniche". 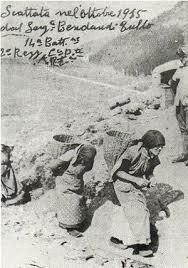 With this expression we usually refer to the groups of women that during the Great War walked more than 1000 meters in altitude to refill with equipment the men fighting at the mountain front of the Carnic region. Inside that typical basket called "gerla" (plural: "gerle") they were able to stuff up to 40kg (almost 90 pounds) of munitions and food. These women were recognizable thanks to a red bracelet showing the number of the regiment to which they were destined. Their age was between 15 and 60. Their salary was 1,5 lire for each trip. The story of these bearers, a special chapter of the story of women during World War One, is one of the aspects you could stumble upon while visiting the Museo storico "La zona Carnia nella Grande Guerra" in Timau di Paluzza (Udine, region of Friuli), especially in the rooms 6 and 7. In the space of this institution founded in 1994 are now gathered finds and relics belonged to the Italian and Austro-Hungarian armies, all coming from the front line called "Zona Carnia", a portion of front including Cresta Verde, Cellon, Pal Piccolo, Freikofel and Pal Grande (see also the this link). Pieces that are worth a mention are a Skoda 75/13 Gun and a smart system of mirrors used by some Austro-Hungarian crack shots, an armor for assault infantrymen (the so called Italian "arditi"). Beside of the standard or extraordinary equipment (the First World War is also a strange story of small and smart handcrafted objects "designed" at the front! ), the visitors will find here a substantial collection of letters, newspapers, documents, coins, medals, stamps, postcards and photos that have not been published yet. But what makes this Italian Great War museum unique is for sure its section dedicated to the "Carnic bearers". "La Zona Carnia nella Grande Guerra"
June: Saturday and Holidays 09:00-12:00 / 14:00 -18:00. From July to September: from Tuesday to Friday 14:30 -18:30; Saturday and Holiday 09:00 - 12.00 / 14:30 -18:30. August: open all days 09:00 -12:00 / 15:00 -19:00. Closed from November to May.